Duns Community Council is to complain to the Queen about what it claims is the unfairness of a South Street property reverting to the Crown Estate and being auctioned off. A spokesman for the council said: “The property in South Street has reverted to the Crown Estate and will be auctioned off, the money being retained by the crown. It was agreed that council secretary Ann Affleck to write to the Queen to protest about the sell-off. 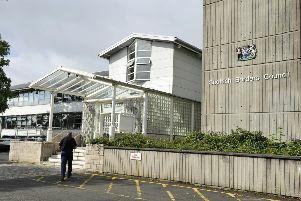 A search for the title deeds of 10 South Street was carried out by Scottish Borders Council officers as part of a review of the titles for all assets held by the council in all former burghs to ensure that the asset register was correct in relation to common good matters. In September last year a report before Duns’ common good sub-committee concluded that “while the subjects known as 10 South Street, Duns, were commonly believed to be owned by the common good fund, the council did not in fact hold a registered title for the property. A Scottish Borders Council spokesperson said this week: “For many years, it has been considered that the property at 10 South Street, Duns, was owned by the council as trustees for the Duns common good fund, although no formal title deeds are held. “As it wished to sell the property without holding title, the council was required by law to obtain the consent of the Queen’s and Lord Treasurer’s Remembrancers (QLTR). “Following various checks as to the title to the property, the QLTR determined that they considered the subjects to be ownerless and that a sale by the council would not be possible. “Instead, the QLTR proposed to sell the subjects in their own name. In doing so, the QLTR stressed that they would not take such an action if it were to be against the wishes of the community and, accordingly, council officers reported on this matter at meetings of the Duns common good fund committee. “The community council was represented at each of these meetings, and their representative indicated the approval of the community council to the marketing for sale of the property by the QLTR. Had such approval not been obtained, the QLTR would not sell the subjects, but neither would the council have power to do so. “The community council has not been responsible for the payment of council tax, or any other costs, associated with this property. When they reported to Duns’ common good sub-committee, council officers expressed concern about the state of the building.